MiG head Sergei Korotkov rejected the suggestion that this project may provoke a conflict between his organisation and Sukhoi, which is working on its own version of a fifth-generation plane. The Russian aircraft-manufacturing corporation MiG is pondering over building a fifth-generation fighter. The new aircraft may be created on the platform of the MiG-35, to be further enhanced by advanced avionics and weapons. According to MiG managing director Sergey Korotkov, the corporation's experts are already working on a concept for the new fighter. “"I know that this is one of the ideas, one of the directions that the design bureau is working on. I very much hope that soon we shall develop this area of work more seriously,” he said. Korotkov did not specify how much progress the corporation has made in its research and development, but said he considered the creation of a new combat aircraft “very likely.” He said, “The most important thing is to have an order for it.” Korotkov rejected the suggestion that this project may provoke a conflict between MiG and Sukhoi, which is working on its own version of a fifth-generation plane, PAK FA. “These are two completely different aircraft, which will be performing different tasks,” he said. The maximum take-off weight of the MiG-35 is 5 tonnes less than that of PAK FA, so, Korotkov believes, it will be more effective in performing most of the proposed tasks. 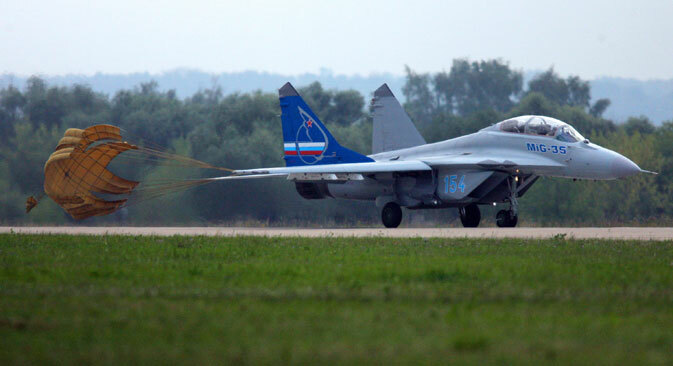 “We believe that the MiG-35 is a platform that may in future become the basis for a fifth-generation fighter,” he said. The MiG-35 may also be sold abroad: there have been media reports suggesting that Egypt is thinking of buying 24 MiG-35s fitted with the RD-33MK engines designed by the Klimov open joint-stock company. Reports from India indicate that the country may also reconsider buying MiG-35s if negotiations between the country and France’s Dassault Systems over the sale of Rafales break down. However, Korotkov refused to comment on these rumours. In April, the MiG corporation won a contract from the Russian Defence Ministry for the supply of 16 additional MiG-29SMT fighters for the needs of the Russian Air Force. First published by VPK in Russian.